Let’s face it, even for a displaced Northerner like me, this last winter was too cold, too long and too depressing. However, spring has sprung, buds have opened, and the early crops are showing up in gardens and farmers markets. Just in case you missed it, there was another opening to herald the season of renewal, Off the Vine has opened the doors on its new marketplace. The store is bright and cheery, and one is greeted by bright and cheery smiles, and surrounded by bright and cheery produce (perhaps I’ve gone too far with the “bright and cheery” theme). It was easy to feel a sense of pride when entering Tess’s shop. I remember when Off the Vine was just a seedling and watched as it was carefully nurtured into a thriving home business. To finally see Tess’s dreams come to fruition (perhaps I have gone too far with the gardening theme) only helps to increase the sense of satisfaction one gets buying local goods. I’m eager to tell family, friends, and strangers about this new addition to the local shopping scene. I want to spread the word about the Off the Vine store as one spreads grass seed. I want to water those seeds and watch customers grow and . . . (I’m doing it again, aren’t I?). 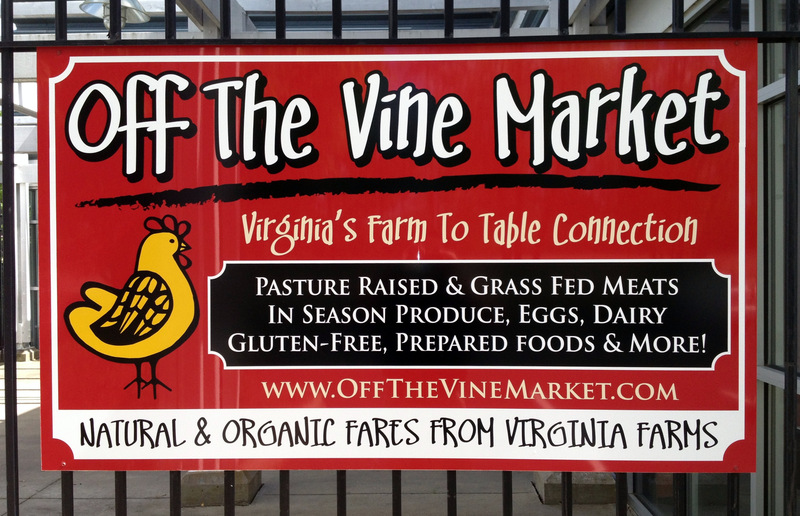 Three cheers for Tess and the Off the Vine family as they move into this next phase of bringing local farmers and consumers together. So, the next time you’re heading to Lowes for your gardening supplies, or to Wal-Mart for that HD Plasma TV, or to Sentara Williamsburg Regional Hospital to have them check out the back pain you noticed after carrying in the Plasma TV and bending over all day in the garden, why not stop in the Off the Vine store and check them out? If you don’t find the experience to be bright and cheery, then you’ve probably wandered into the Realty office next door by mistake.